Home > News - June 2016 > Mutual Fund Investment: Registrar & Transfer Agent..! Mutual Fund Investment: Registrar & Transfer Agent..! An Registrar and Transfer Agent (R and T) agent is an intermediary who takes care of the back-end processes of a mutual fund, processing all financial and non financial transactions. 1. Who is an R & T agent? An R & T agent maintains re cords of every mutual fund transaction on behalf of the fund house, through his net work of offices across the country . CAMS, Karvy and Sundaram BNP Paribas Fund Services are some registrars for mutual funds. ICICI Pru., HDFC, Birla Sunlife Mutual fund house are all serviced by CAMS. Reliance and UTI are serviced by Karvy. An R & T agent, through his wide network of branches across the country , helps process both financial as well as non-financial transactions, gives investors forms of fund houses, and even sends out account statements. An R & T agent also helps investors with information and details on any new fund offers, dividend paid, consolidation of folios or / any such information. All these de tails are also available from fund houses. Investors can get information about various investments in different schemes of different fund houses at a single place from the R&T agent. 2. Why do mutual fund houses appoint them? Every day mutual fund investors do a number of transactions, like buying, selling or switching units. Besides these financial transactions, they also do non-financial transactions like a change in bank details, change in contact details or address. Each such request needs to be recorded and the fund house is supposed to maintain records of each such transaction. Since most MFs may not want to invest in these processes nor do they have the expertise to handle these huge transactions on a professional basis, they outsource this work. The registrar and transfer agents (R&T agents) help them perform this job. 3. How do mutual fund houses benefit from an R & T? From a mutual fund's perspective, R & T agents provide greater access across the country and help save costs. Due to their having offices across the country , they serve as branches for the mutual funds and help them in their sales processes. Typically , every investor looks to invest in multiple schemes, which may be from different fund houses. As per the rules of Securities and Exchange Board of India, there is a cut-off time by when the investment has to be made to be eligible for that day's NAV. So, to make multiple investments, an investor will have to run around multiple fund houses. 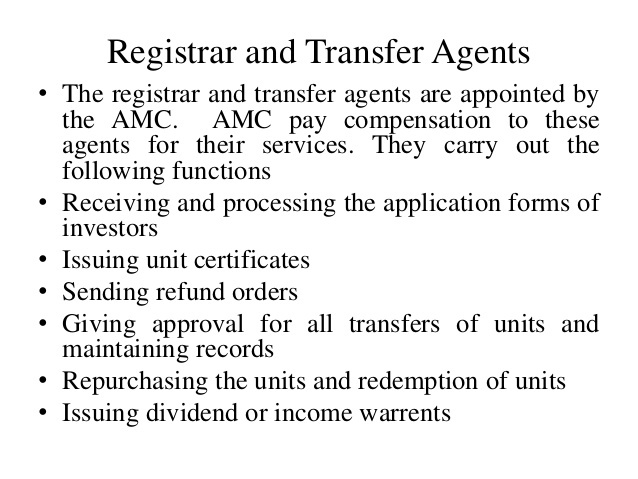 Instead, he can use an R&T agent's services to conduct all his transactions. Suppose he invests in Birla Sunlife MF, HDFC MF and ICICI Pru. MF, he can use the services of CAMS only. The mutual fund house pays money for the services offered by the R&T agent.